How a local blood soaked Kazakhastan woman came to confessing to stabbing boyfriend to death. A shocking video has captured the moment a discombobulated woman running along the ice packed streets of Temirtauin, Kazakhastan pulls over a passing car only to tell its two shocked occupants that she has just killed her boyfriend lover. 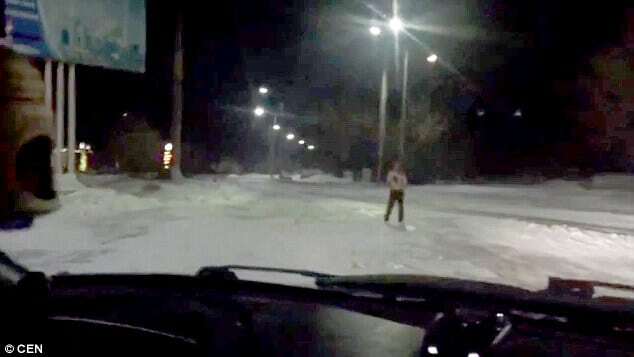 The video starts off just moments before the distressed woman staggers towards the two men sitting in a car on a snow covered road in the city of Temirtau in north central Kazakhstan. With the woman moving in their direction the car’s headlights are turned on with the woman now moving closer towards the car. Standing outside the passenger window, the woman begins to frantically motion to something in the dark, her blood soaked hands very much in view. As the 29 year old woman waves her hands, she appears to gesticulate towards where the killing may have taken place. Rather than sticking around, the two men look to flee the scene as one of them is heard is saying, ‘let’s go, let’s go’ as the woman speaks. Following the encounter, local police told of the woman being arrested and charged with murder. A report via the dailystar tells of the incident triggering debate with many criticizing the lack of action by the two men in the car she turned to for help. The case is now a murder enquiry and the woman risks a sentence of life imprisonment if found guilty of the crime.